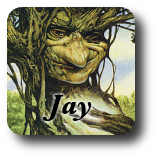 Design a mono-green creature card. I know deathtouch is fair game for green, but it seems like it ought to be reserved for some very special circumstances. Justifiable in mono-G, but that could be a gruul card no problem. I see why this green creature has haste (usually reserved for tourney rares, but sometimes uncommons) but I'm not sure why it has deathtouch or why we should be excited about the combination. I can imagine a Standard where the green deck needs a little more speed and an answer to something big another deck is packing. Or maybe all the myrmidons in the set have one of haste and deathtouch, and this happens to have both. I guess. It was trying to be a top down insect/centaur. Deathtouch and haste is an interesting combination, mostly because deathtouch is such a defensive ability but it's also a really interesting offensive one. As long as all lands you control are Forests, Insectile Charger gets +1/+1. A 3/4 for two in a mono-green deck would make a splash even in Modern, I think. Usually cards that reward having a lot of one type of land just cost NC instead of NCC because they already push the player that way. I'd guess Dev would make this 1G 2/2, as a 3/3 for two is still quite good but as-is is possible too. That's real strong, but if the set wants green's best common to be a bear, this could be it. When CARDNAME enters the battlefield, you may exile target non-Insect creature until CARDNAME leaves the battlefield. If you do, that creature's controller gains control of CARDNAME. Ooh, this is a cool concept. I thought about it for a few seconds more and woww I like it a lot!! So much flexibility. whoa. You're over-writing their good creature with your terrible creature. Like Utopia Vow but greener. I dig it. Beast Within is very similar, more permanent, but gives them something bigger. 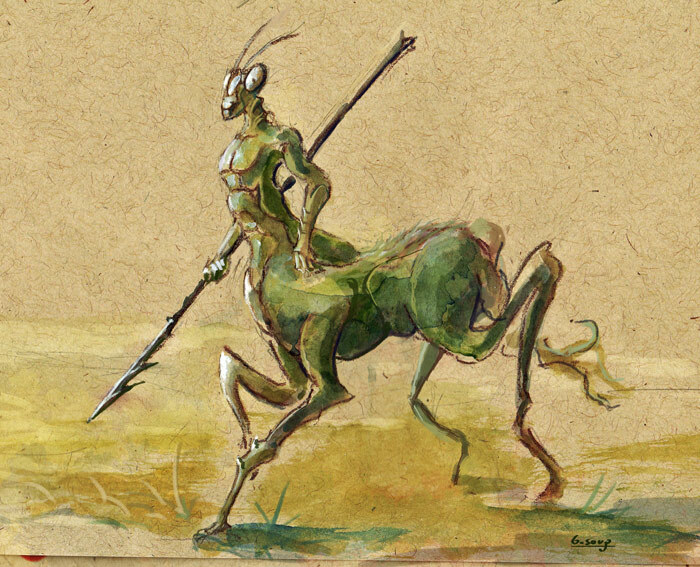 Was going to say the weak spot in this submission is the flavor, but I guess we just insect'd a centaur. One change I would make is to remove "non-insect." I don't think it adds anything, nor impacts power significantly, and insects eat each other All The Time. It's like their favorite thing. I guess it does prevent you from Carapace'ing a Carapace, thus freeing the original target, but like, just don't do that, right? That makes some nice tension. I'm never not going to be happy to see resourceful creatures. Javelliner can be a 3/3 for 3, a 2/2 that kills a 1/2, or trade with an X/2. Before Kaladesh I'd have said this was right for uncommon, but I wouldn't be shocked to see such at common now. GG: Aximili loses all abilities then becomes a 6/1, 4/4, or 0/8 until end of turn and gains one of the following abilities, Trample, Hexproof, or Deathtouch. GG: Aximili loses all abilities, then becomes a 6/2, 4/4, or 1/7 until end of turn and gains one of the following abilities: Trample, Deathtouch, or Hexproof. Aximili is the legendary version of rootwalla. Or a resettable Primal Plasma/Primal Clay. Or an Urza's Avenger. Okay, it's not quite any of those things, because you can activate it multiple times each round, makes it huge (one way or another), and give it keywords at no cost to p/t. Let's break this down. It's base is 3/3. You can make it 6/2 trample (best when trading), 4/4 trample (best evasion), or 1/7 trample (silly); 6/2 deathtouch (silly), 4/4 deathtouch (fair when double-blocked), or 1/7 deathtouch (amazing blocker); 6/2 hexproof (max aggro), 4/4 hexproof (trolls are good), or 1/7 hexproof (max cowardly). And it's very relevant that you can switch to any of those at any time… any number of times. What we have here, is green Morphling in disguise. Take that, Thornling. I would either limit activation to once-per-turn or make changing an upkeep trigger. I would also think hard whether to allow 10 modes (2-3 of them silly) or just assign one keyword to one size and be done with it. The modularity is pretty cool, and may be worth keeping, but if so I'd want to focus on that and optimize it. You can stack the triggers, but once the stack is clear, Aximili is stuck at his stats until the end of turn. The ability gets rid of itself temporarily. Scion of the Ur-Dragon works similarly. When CARDNAME dies, you may pay 1GG. If you do, put X +1/+1 counters on target creature, where X is CARDNAME's power. Even if Kraul never evolves (and it's easy to do), you still get a 3/1 for 3 plus a blanchwood armor to cast. Having that much mana open can be tricky, which is good because a card with this much potential needs a shields-down moment / strategic commitment. Maybe this needs to be rare, but I think it's just a very good uncommon. Nice. The word scavenge did come to mind. Whenever ~ is dealt damage, you may pay 2G. If you do, search your library for a card name ~ and put it onto the battlefield, then shuffle your library. We've got a reach bear (which tend to be uncommon more than necessary) that can get you more like it when it -ETBs- -dies- is dealt damage? I like that it puts the copies directly into play and for a higher cost; that solves issues of playing Squadron Hawks purely for card advantage with no intention of playing all of them. I like that it triggers at a time that isn't 100% controllable, allowing players to play around it. I can't figure out why it triggers on taking damage, rather than dying, especially when it only has 2 toughness. Flavor, I guess? But triggering on dying is just as flavorful. Usually creatures that get copies of themselves aren't good enough to maindeck in Limited as a one-of. It might be a problem that this is. Doubtful it's much of one, but good luck drafting more than 2 of these. 1G: Put a land card from your hand onto the battlefield tapped. I'll bet that ability is broken, somehow.